China Holidays Blog: Our Colleague Hua Jiang is volunteering at the London Olympic Games! 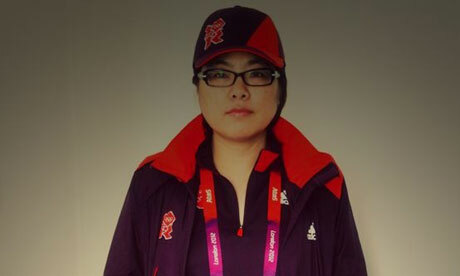 Our Colleague Hua Jiang is volunteering at the London Olympic Games! This is her story as published in Guardian on the 17th Jul 2012. We at China Holidays wish Hua all the best at the London Olympic Games. For Hua Jiang, being an Olympics volunteer at the Aquatic Centre will be in its own way a case of taking the plunge. Hua, who works in a central London travel agency, has never done anything like it before. Her annual holidays are usually a trip to Tianjin, a city 70 miles south-east of Beijing. This summer she has signed up for Stratford, London E15. Early starts – some duties begin at 6.15am – are not enticing, but everything else is. "Everyone says the Aquatic Centre is the most beautiful venue at the London Games," says Hua. "I think it will be second only to the Olympic Stadium in attracting the most attention. "I'm not a fan of celebrity culture but if I get to see Michael Phelps [winner of eight gold medals in Beijing] I will be very happy. Also, the diver Tom Daley." Hua adds with a grin: "The Chinese have some very good divers too – they're known as the Dream Team. "I was so pleased to be allocated to the Aquatic Centre. The wave-shaped roof is really beautiful. But people will be astonished by the inside, how big it is; the spectators have a brilliant view. It's a shame that I haven't had a chance to see the Water Cube which was the swimming venue in Beijing. I'd like to compare them." Her fluency in Mandarin and English will be useful with China competitors and visitors – something the Olympic organisers are no doubt aware of. The Games will be hard work for all the volunteers. Some shifts will last six hours – others around 10 – and all unpaid, of course. Hua has attended three days' of training on Saturdays. "I've been given my uniform, a T-shirt, jacket, trousers and trainers, plus a travel card for the Olympics, a watch, and an umbrella – a red umbrella," she says. "Of course, I don't know exactly what to expect – except that it will be hard work – but I have no complaints and I've spent the last six months looking forward to this." Hua has been encouraged along the way by her employers and staff at China Holidays Ltd. "I'm very grateful for that. Somehow, I feel there is this connection and that I'm part of the Olympic family." What stirred her enthusiasm? She watches big football games, and rugby union internationals, but is not a sporty person. It was probably the opening ceremony at the 2008 Beijing Games. She bought a DVD of the ceremony and has watched in several times. "It was so spectacular. On such a big scale. I was so impressed. "In fact, I had considered volunteering for Beijing 2008, and going back there for my holidays, but there may have been accommodation problems for me in Beijing, so I dropped the idea. "In fact I suppose I was becoming more and more interested the very moment that London won the 2012 bid in Singapore in 2005. I was cheering for London back then, but I would never imagined I would be in the Aquatic Centre as a volunteer. Working in a travel company, all I thought was that Britain has been handed a huge opportunity. "When the volunteering chance came round for London I registered as soon as they started recruiting. I waited a long time to hear back. I knew someone else who got their invitation to an interview quite quickly but it was several months before I got mine. I had my interview in February and received the offer in early March. It was all starting up, I was pleased. "Some people are saying it will be excellent experience for us volunteers, gaining experience of how big events are organised and run. That's true but my main thought is that it's great to know I'll be part of it all. And one thing I want to do after all this is to learn to swim. It's something I've never really tried hard to do. If I don't after working at the Aquatic Centre, I never will. "I attended venue training recently. Since then, I've been to training at Hackney Community College, who taught us some of the skills and knowledge I will need to carry out my duties. There was also a workbook for us to get familiar with all aspects of the Games. I will be cheering for the British and Chinese competitors at the Olympics."